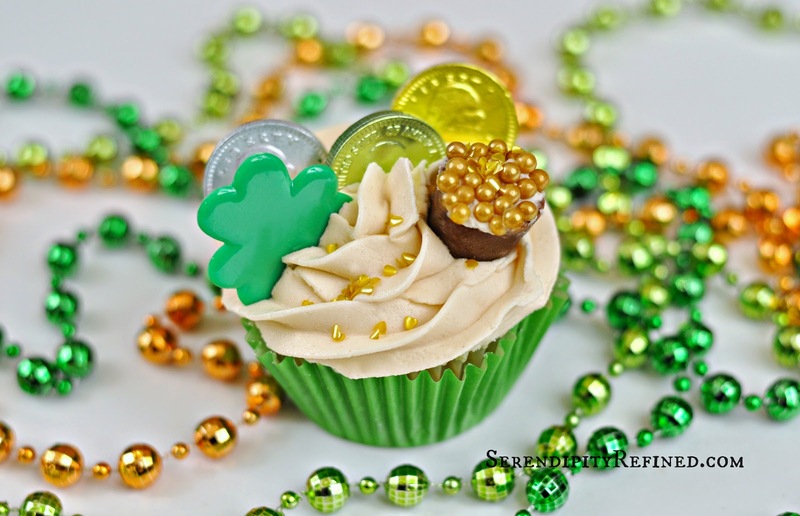 St. Patrick's Day is just around the corner and to celebrate the occasion, this Irish lass is baking Bailey's Irish Cream Cupcakes to celebrate and I'm sharing the recipe with you! 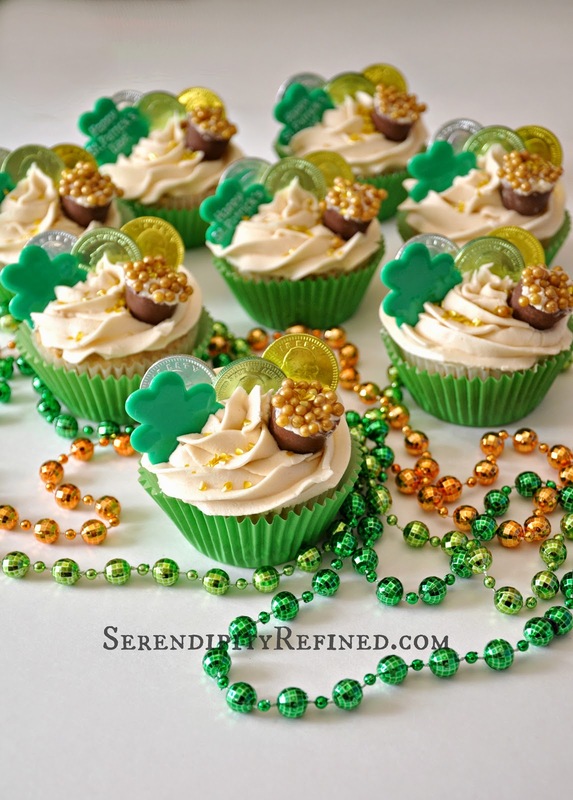 They've got a hint of cinnamon and are topped with Bailey's butter cream icing. 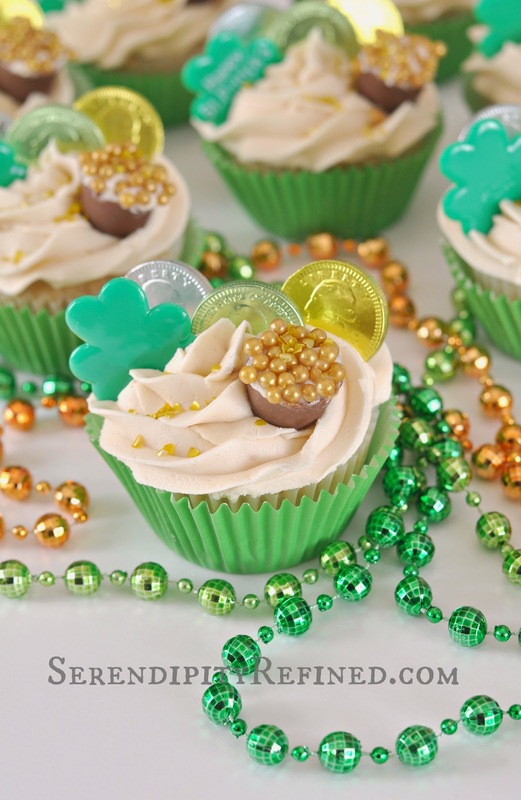 They're easy to bake, and for those of you who would rather not use alcohol, I have found that Irish Cream coffee creamer makes a good substitute for the Bailey's. In a large bowl, whisk together flour, baking powder, salt and cinnamon. In the bowl of an electric mixer fitted with a paddle attachment, cream together butter and sugar until light and fluffy (approximately 2-3 minutes). With the mixer on low speed, add the eggs and egg whites one at a time mixing well between additions. Incorporate the flour mixture, by hand, approximately 3/4 cup at a time (3 additions) alternating it with the Bailey's. Begin and end with the flour. Do not over mix. Fill the cupcake liners about 2/3 full and bake for 15 to 17 minutes until a toothpick inserted in the center comes out clean. Be careful not to over bake. To make Bailey's Cinnamon Butter cream Icing: (Enough to "traditionally frost" 24 cupcakes. For "fancy frosted" cupcakes, double the recipe). In the bowl of a mixer fitted with the paddle attachment, beat the butter until it is light and fluffy. In a large bowl, whisk together the powdered sugar and cinnamon. Add the powdered sugar mixture to the butter, 1 cup at a time, mixing well after each addition. Add the Baileys and mix until well combined. 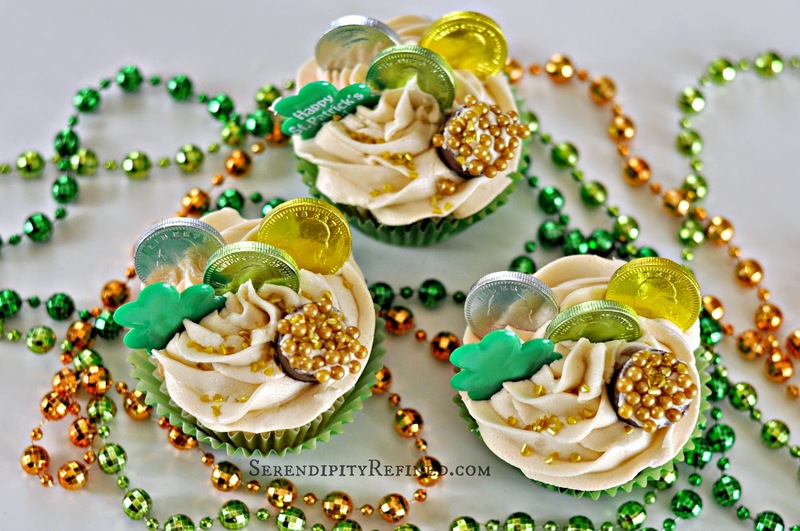 Using a fork, poke holes in the tops of cupcakes and brush with Baileys. Fit a pastry bag with a large tip and fill it with the icing. Pipe the icing onto the tops of the cupcakes. 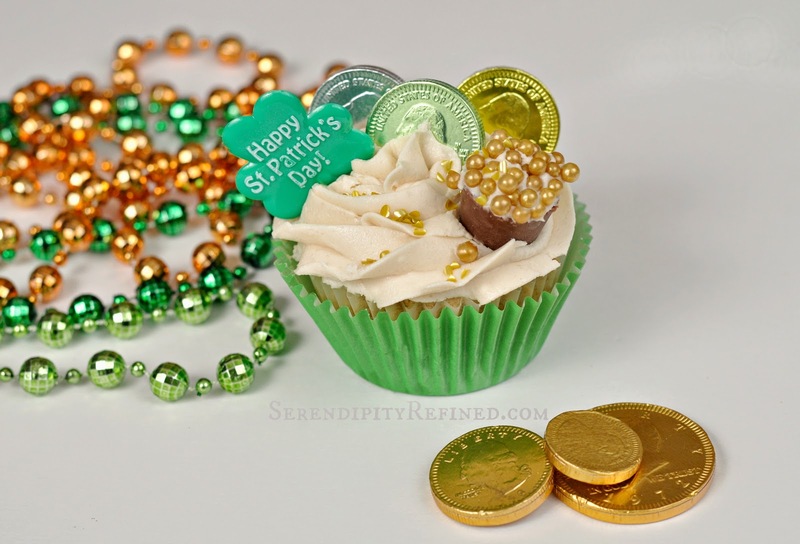 Add gold candy coins, Rollo cups with gold sprinkles, shamrocks or whatever else makes you smile. 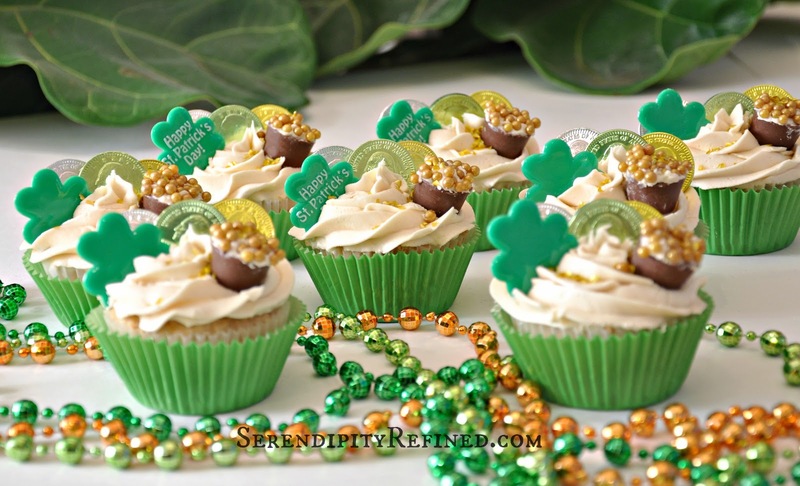 The luck of the Irish is certain to be with you when you bake these Bailey's Irish Cream Pot of Gold cupcakes with Bailey's butter cream icing for your family and friends. And speaking of luck, I hope that you'll stop by on Monday for information that may help you to find your very own POT OF GOLD.... just in time for St. Patrick's Day!